"Sir John Cass Redcoat is an Outstanding School"
Headteacher and Chair of Governor Ofsted Report Statement – Read the headteacher and chair of governor statement regarding the recent Ofsted inspection. Give Ofsted your view on your child’s school. Click here to find out how. We are delighted to share with parents and the Tower Hamlets community some of the outcomes of the recent Ofsted inspection of our school. 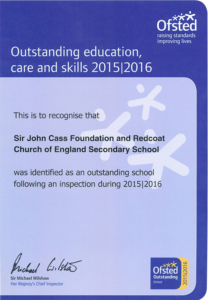 HMI have decided that Sir John Cass Red Coat “is an outstanding school”.